Data recovered from the expedition shows the terraforming microbe breaks down organic compounds into their base elements. Scientists don't know how to stop it yet and its growth rate is increasing. Unless a breakthrough is made, the Blight will consume the entire planet. We must start constructing another starship as a contingency. The first step of this project will be developing our rocket boosters and launching a satellite into orbit. 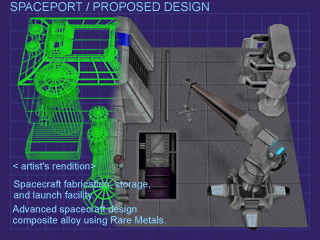 Computer models show that New Terra has natural resources barely sufficient to support construction of a starship as the Blight spreads. We must continue to move just ahead of the Blight and exploit as many of these resources as we can. Projections also show that we are missing valuable data about the starship construction. Our scientists have identified a crash site of the starship Conestoga, which brought us to this planet many years ago but crashed when its orbit decayed. To gather more data we must prepare a convoy of Scouts, Cargo Trucks, and armed escorts to explore the site and recover parts of the wreckage. This will allow our scientists to reverse engineer the parts and expedite our new starship construction. We do not know what threats we will encounter and we must be ready. The Standard Lab will no longer serve for some of the more complex research tasks. An Advanced Lab will be built so new research topics may be pursued. These research topics may be volatile and prone to accidents. Be careful where you construct the Advanced Lab. The Tokamaks have shown that they degrade over time and require frequent repair. Pay attention to them or they may become unstable and explode. As our colony expands we need better power producing alternatives. Our remote operations of vehicles is limited as well. A Robot Command Center with dedicated Savant computers will allow more control of our vehicles. The vehicles will also be able to use more complicated “smart routing” algorithms to improve their transit times. The Robo-dozer has proven to be useful in decreasing building times for structures. When placed on a pre-bulldozed area, structures are completed in substantially less time. Bulldozed roads will allow vehicles to travel over rough terrain much more rapidly as well. Medical Centers will reduce the mortality rates of our workers and scientists. The area we have moved into has rich deposits of needed ores, and some unusual kinds of ores as well. However, this area holds a new threat as well: potential volcanic activity which may be a side effect of The Blight. Computer projections of what we will need to succeed are shown in the Specific Objectives list. Keep at least 40 children alive. Keep at least 30 workers alive. Keep at least 20 scientists alive. Completely research Independant Turret Power Systems. Have a Common Ore Smelter kit in storage.